With the combine complete and most big names off the open market, the draft experts have put together some mock drafts recently and here is who they have the Green Bay Packers selecting. For the second season in a row, the Green Bay Packers have missed the playoffs, and it is now up to General Manager Brian Gutekunst to put the Packers in position to return to their winning ways. 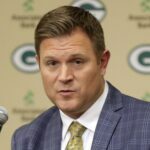 Gutekunst addressed some major needs in free agency, but perhaps even more important to the Green Bay Packers’ future success is nailing the first round of this year’s draft. With two selections, they are in a great position to add some playmakers to this roster, which is greatly needed. By being active in free agency, the Green Bay Packers have given themselves more flexibility in the draft as they don’t have to feel tied to a certain position at a particular spot. And that flexibility shows with the latest round of mock drafts that the experts have released. Without further ado, the Green Bay Packers are on the clock. Given that the Green Bay Packers have addressed the edge and safety positions in free agency, I have been slowly warming up to the idea of taking a tight end with the 12th pick. With that said, if Ed Oliver or Brian Burns are available, they should take either of them no matter what. However, there is no doubt that Green Bay would be gaining a difference maker with Hockenson. His ability as both a blocker and a pass catcher would fit perfectly into Matt LaFleur’s offensive system. Landing Adderley at 30 is a very solid pick as well. He brings versatility that defensive coordinator Mike Pettine will love to have by being able to line up single high, in the box and even in the slot. Additionally his ball skills will give the backend of this secondary some much needed playmaking ability. This is by far my favorite draft of the bunch. Selecting Oliver at 12 will make the Green Bay Packers defensive front absolutely terrifying and in one offseason Gutekunst turned a weakness into a strength. If Fant is available at 30, the Packers shouldn’t hesitate to make that pick as it would be a steal. He will be an immediate impact player from day one and will be another great weapon for Aaron Rodgers to utilize. Fant runs a diverse route tree that will make him a threat on the short to intermediate routes while also being able to stretch the field and make contested catches. Even with Metcalf’s incredible combine, I do not like taking him with the 12th pick. With his size and speed he would give Green Bay big play potential, but overall his numbers at Ole Miss were nothing to write home about. With players like A.J. Brown or Deebo Samuel for example available later on, I’d much rather have one of them and use the 12th pick on another position. In this scenario, with Brian Burns being on the board at pick 12, I am not a fan of the T.J. Hockenson selection, but what is even more ergrigious is selecting Ridley with pick 30. Ridley is a solid route runner with good hands that would most likely take over Randall Cobb’s role in the slot, but my concern is that he isn’t overly athletic by any means. In fact, he’s actually below average for the wide reciever position. Using the Relative Athletic Score, Ridley scored a 4.48, which is well below the type of athlete that the Green Bay Packers have selected in the past. Once again, with players like A.J. Brown or Deebo Samuel still available at receiver, I’d much rather have one of them, or preferably waiting until the third or fourth round to select a receiver. This is another draft that I would be very happy with. The Green Bay Packers solidify their defensive front and the backend of the secondary with two game-changing playmakers. The free agent signings made this offseason coupled with these two draft picks would give the Packers a very stout defense, which they haven’t had in years. Pack-A-Day Podcast – Episode 274 – Draft Preview Part 24 – DRAFT DAY!! !